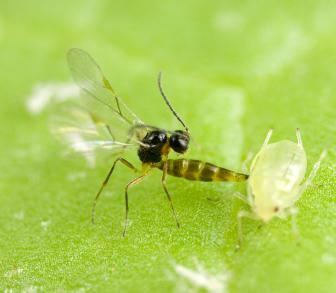 The female wasp lays its eggs into the body of the aphid. The egg hatches inside and the larva feeds and develops into a fully formed wasp killing the aphid in the process. The aphid body bloats and develops a crusty shell called mummies.When the wasp is mature it cuts an escape hole in the back of the aphid and emerges to mate and feed and the female then searches for aphids to lay more eggs. 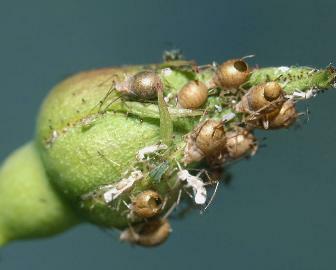 Aphidius are supplied as aphid mummies. Wasps emerge soon after arrival. 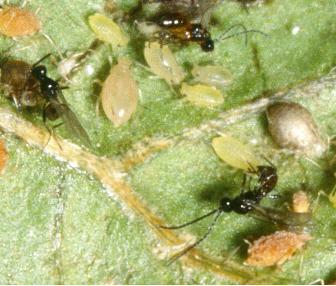 The mummies are supplies on cards or in a carrier like vermiculite.Releases of mass-reared Aphidius at the first sign of aphids facilitates quick establishment. If aphids are anticipated releases can start even before aphids are detected. Release rates will range from 1 500 mummies per hectare for low pest levels and inoculative releases, to 5 000 per hectare for high pest levels and quick knock down. Two or three releases a week apart are recommended in most situations. For preventative treatment, weekly introductions at low rates is recommended." Or view or download a PDF file of the Book entry for Aphidius.